6 Comments for "Cowboy Salad"
I like how this recipe lasts a couple days. Perfect for a potluck and then you have leftovers. We eat it with corn tortilla chips. This recipe is always a hit. I recently made it for a group in an assisted living facility and they enjoyed it. I served it with whole wheat pita bread that I cut into triangles and toasted in the oven. Wonderful recipe! We eat it all the time for years now becuase it is so versatile and most of the ingredients I always have in the pantry. It can be used as a salad on its own, a baked potato or taco topping, or as a salsa. And we bring it often to potlucks and it is always eaten up :)! 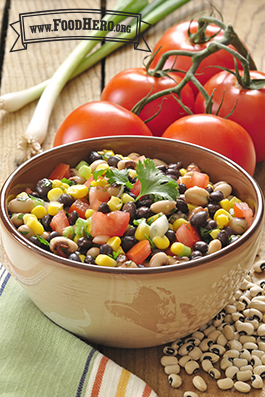 I substituted cooked barley in place of one of the cans of black beans and my family loved it. It was a little easier on the tummy for someone who's sensitive to the fiber in beans. Barley's a whole grain and made a great chewy substitution. This is great and easy to make. Can also use fresh or frozen corn. This recipes is great! Even kids love it! Try it plain or eat it with tortilla chips!